A Nod's As Good As a Wink... to a Blind Horse is the third album by the English rock band Faces. The album became their most successful album, partly because of the solo success of lead singer Rod Stewart. It features their single hit "Stay with Me" and it's a consistent and creative album. The Rod Stewart/Ron Wood compositions are strong and their finest hour is definitely one of a name. The blues-tinged rock music has got some honky tonk piano tunes and fine psychedelic edges. They were one of the best party bands of their time, with raucous and sloppy live shows. They're showing these skills in the energy of the songs. MOV puts out another top quality reissue. Very nice cover with rice paper inners. The vinyl is outstanding. 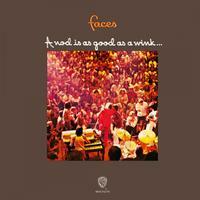 Faces best release really shines on this reissue.